Call 603-815-4181 to contact any of our restaurants. Click on a location below to view menus and directions. Thank you for an amazing summer, see you next year! wedding or corporate event. Click below to book your event! We love that YOU love to share Lexie's with your friends and family! Giving the gift of Lexie's is easier than ever, click below to purchase a gift card online. Prefer the old fashioned way? You can still stop by any of our restaurant locations to purchase directly from a staff member. We love when our customers rock their Peace, Love, Pride! Each of our locations carries a variety of apparel and merchandise including hats, tees, kids shirts, and bumper stickers. Stop by today to check out our current selection for yourself or the Lexie's lover in your life! At Lexie's, Peace, Love, Burgers isn't just our logo, it's a way of life, and we strive to put that positivity into everything we do. Lexie's engages in charity events throughout the year, and our contributions focus on kids and families within each Lexie's community. If you are seeking a donation, please submit a request using the form below. It's a simple story of boy meets girl, boy meets grill, boy and girl and grill team up to create a quaint little Joint where you can always rely on fresh ingredients, and inventive takes on the classic American burger. At its roots on Islington Street in Portsmouth, NH, their idea took shape and took off. 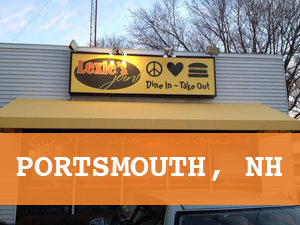 Followed, a few short years later, by Lexie's Newburyport where KC and Lexie continued to grow their brand. In 2016, a huge year of expansion for the company, Lexie's Durham, Lexie's Exeter and The Burger Bus entered the scene. As the company grew, so did the family. KC and Lexie are now joined on this crazy ride by kids Kaya, Holden, and Henley. They continue to hone the recipe for success, along with the ones that got them started, as we continue to expand as a company and learn and adapt to the communities where we set up shop. Please choose from the options below so we will know where to direct your email. Thank you! Is your question or comment specific to a Lexie's location? Please let us know! Thank you for reaching out to Lexie's! We will get back to you as soon as we possibly can.